The totally new 460mm cutter offers print and copyshops all the features previously found only on very large professional machines that cost £1000’s more. push out function! Others have only manual back gauge settings. Full LCD display with keyboard! Others only offer no display at all or as an expensive option. Overhanging front guard for long paper. Amazing features for an outstanding price! Compliant with all European safety features including lightbar guard, two handed operation, keyed power operation. Fully installed by trained operators. At less than £3000 the X-Press OnDemand Easy Cut 460mm paper cutter also leads the market in terms of affordability. From only £17 per week on a lease agreement this machine certainly won’t break the bank – leaving you more profits in your pocket! With typical accuracy at better than 0.2mm the X-Press OnDemand EasyCut is no low quality cheap option. 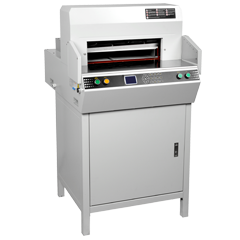 Also incorporated in the product is an illuminated cutting guide line, stainless steel base plate and an adjustable 15000N pressure clamp to hold your paper firmly in place. The machine is precision made with the major parts constructed out of cast iron. The cabinet is constructed from heavy duty steel.